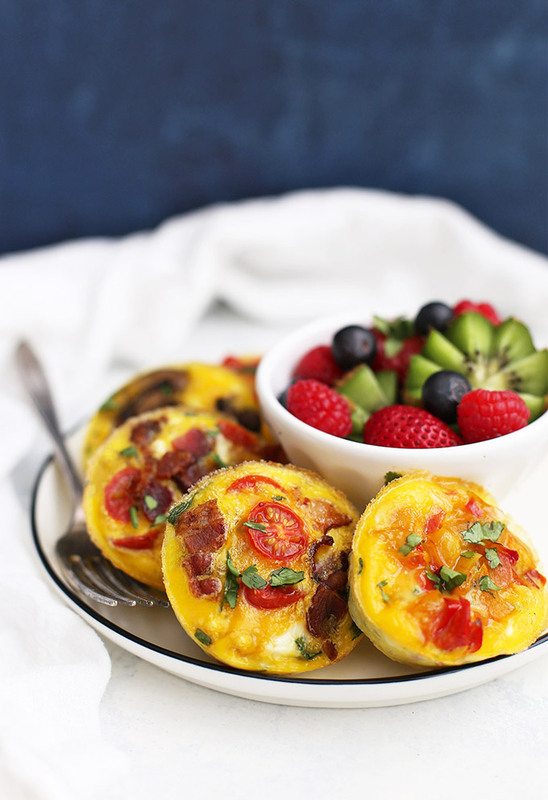 Easy Paleo Mini Quiche – These little egg cups are a perfect make-ahead breakfast or lunch on the go. Add your favorite meats and veggies to keep things interesting! Originally posted Nov. 2015. Post, photos, and recipe updated Dec 2017. It feels like this has been the year of meal prep. Everyone seems to be looking for ways to save time and energy in the kitchen and all I can say is AMEN to that! 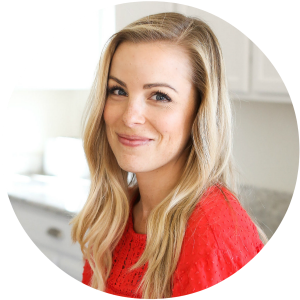 It’s so much easier to eat healthfully and have plenty of energy when you have a few things prepped ahead of time. 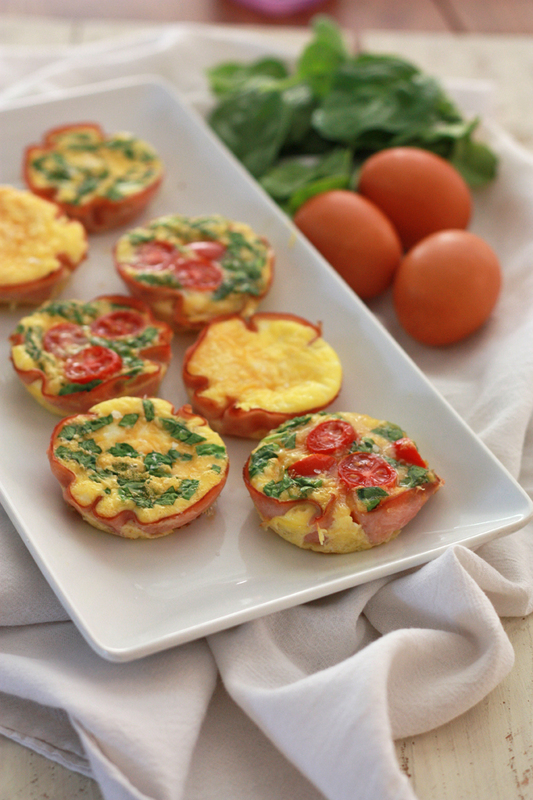 This Paleo Mini Quiche have been one of my most popular recipes in the last few years. They’re easy, convenient, and endlessly customizable. You know what that means? NO MORE GETTING BORED! I love that I can make a whole pan at once and have breakfast ready to go for several days. I can make a whole batch all the same, or make each individual egg cup just a little bit different. Mini quiche are a great way to use up leftover produce, greens, or herbs in the kitchen and can easily be loaded up with veggies, or packed with extra protein. Since the “recipe” is more of a formula, I thought I’d share a few of my non-negotiables. First, I always use a silicone muffin pan pan. It’s completely (totally, utterly) nonstick and spares me needing to grease or line any muffin cups. I set the muffin pan on a baking sheet (to prevent anything accidentally sloshing around) and the quiche pop right out of the muffin pan when they’re done! (You can totally use a traditional muffin pan, you’ll just want to grease the muffin cups first). Pre-cook anything hard. Butternut squash, sweet potatoes or white potatoes, etc. will do best when they’ve been cooked beforehand. Depending on your own preferences, you may also prefer to saute things like mushrooms, bell peppers, or onions ahead of time too. Cook your protein ahead of time. Crisp up any bacon, brown that sausage, etc. Beyond that, it’s largely up to you! Load them up with veggies–bell peppers, onion, tomatoes, cooked squash or sweet potatoes, spinach or kale, mushrooms, etc. Add in any additional protein you like (bacon, sausage, chopped ham, etc.) and finish things off with some fresh herbs if you like! You can even set out all the different add-ins you have on hand and let everyone “build” his or her own, kind of like making a pan of omelets all at once. 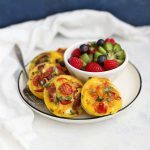 Whether you make them all for you for meal prep, or make a batch for a big weekend get-together, brunch, or breakfast, these paleo mini quiche are such a yummy take on eggs! One important tip is that you cook any meats or dense veggies (onions, peppers, potatoes, squash, etc.) beforehand to ensure even cooking, which makes them an excellent way to use up leftover sautéed or roasted veggies from dinner! I don’t worry about cooking greens, mushrooms, or herbs ahead of time, as I find they do just fine without pre-cooking. I swear by this muffin pan! This is the silicone muffin pan I have. We use it for savory things, like these quiche, or to big batches of muffins for breakfasts, snacks, and lunches. It’s easy to clean and easy to store. We also have the mini muffin pan, which is fantastic for anything child-sized. Can you freeze these? Yes! I freeze them in a single layer (so they don’t stick together!) and store them in an airtight container or freezer bag. You can re-heat them in the oven or microwave, or let them thaw in your refrigerator before heating. It’s up to you! A fun variation. I sometimes do and sometimes don’t line the muffin cups with ham or prosciutto, depending on whether I have some to use up. It makes a kind of “crust” at the bottom that can be nice. 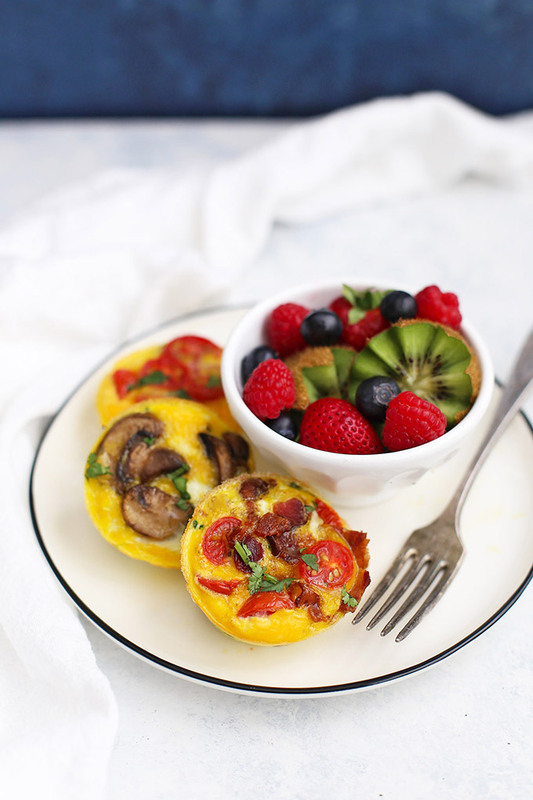 Just add a slice of ham or prosciutto first, then add your veggies/meat/eggs. Get Creative With Veggies. Think outside the box! Why not try grated zucchini, sun-dried tomatoes, or green chile? Meal Prep in Minutes – Lots of ideas for quick & easy meal prep! 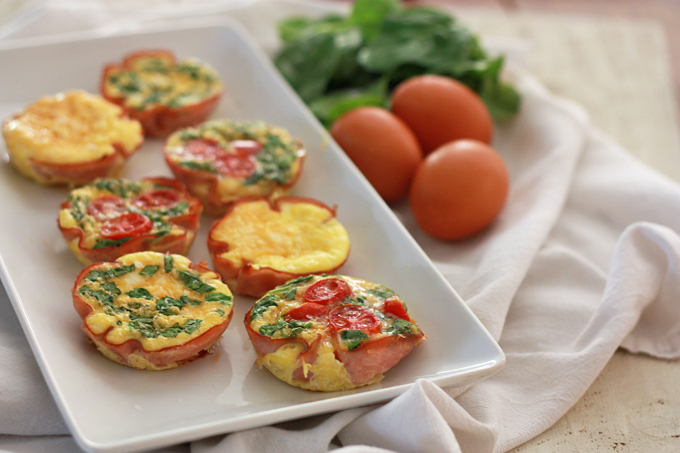 These paleo mini quiche are PERFECT for meal prep or grab-and-go breakfasts. Mix and match toppings to make all different flavors or make them all the same. Your choice! 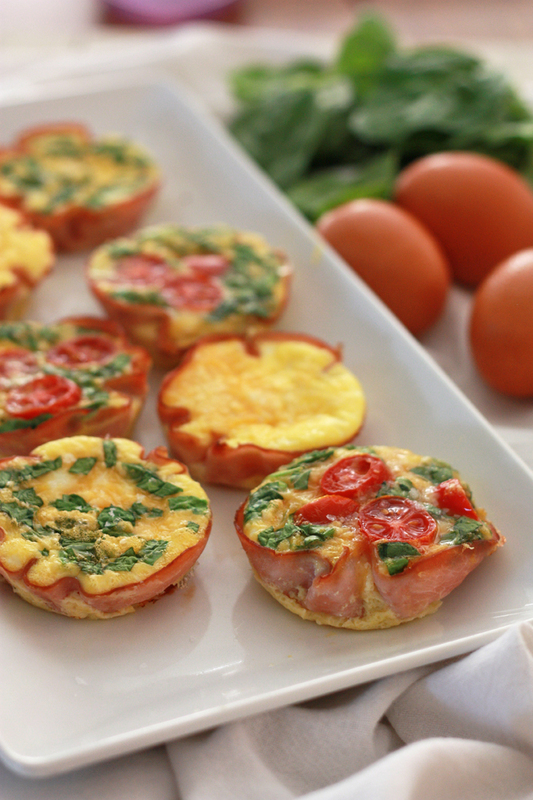 If desired, line a silicone muffin pan with ham or prosciutto slices. 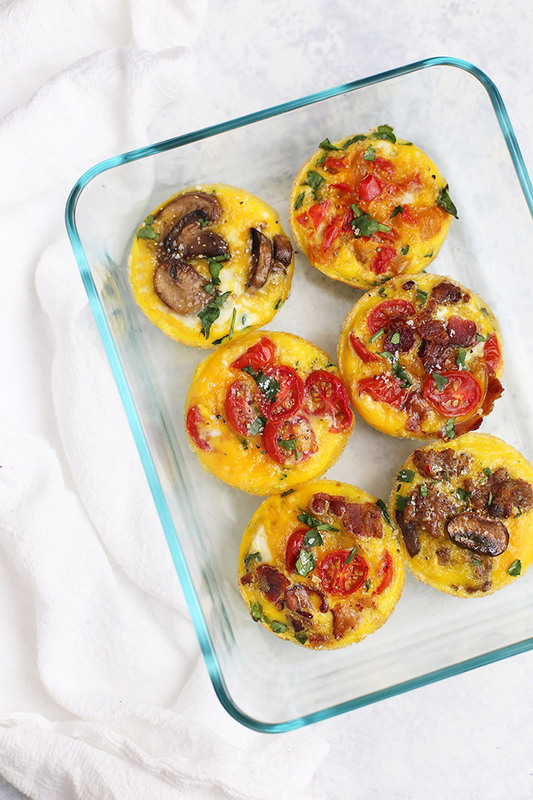 Add a few tablespoons of veggies and protein to each muffin cup, filling about 1/2 full. In a medium bowl, whisk together eggs and a pinch of salt and pepper until quite smooth. Gently pour egg mixture over the veggies/meat in each cup until at least 3/4 full. Bake at 400 degrees 15-20 minutes, or until just set in the center. Allow to cool 1-2 minutes in the pan before transferring to a plate or container. ONE IMPORTANT TIP is that you cook any meats or dense veggies (onions, peppers, potatoes, squash, etc.) beforehand to ensure even cooking, which makes them an excellent way to use up leftover sautéed or roasted veggies from dinner! I don’t worry about cooking greens, mushrooms, or herbs ahead of time, as I find they do just fine without pre-cooking. You also want to pre-cook any protein (bacon, sausage, etc.) you plan to use. TO FREEZE LEFTOVERS: I freeze them in a single layer (so they don’t stick together!) and store them in an airtight container or freezer bag. You can re-heat them in the oven or microwave, or let them thaw in your refrigerator before heating. It’s up to you! A VARIATION: I sometimes do and sometimes don’t line the muffin cups with ham or prosciutto, depending on whether I have some to use up. It makes a kind of “crust” at the bottom that can be nice. Just add a slice of ham or prosciutto first, then add your veggies/meat/eggs. 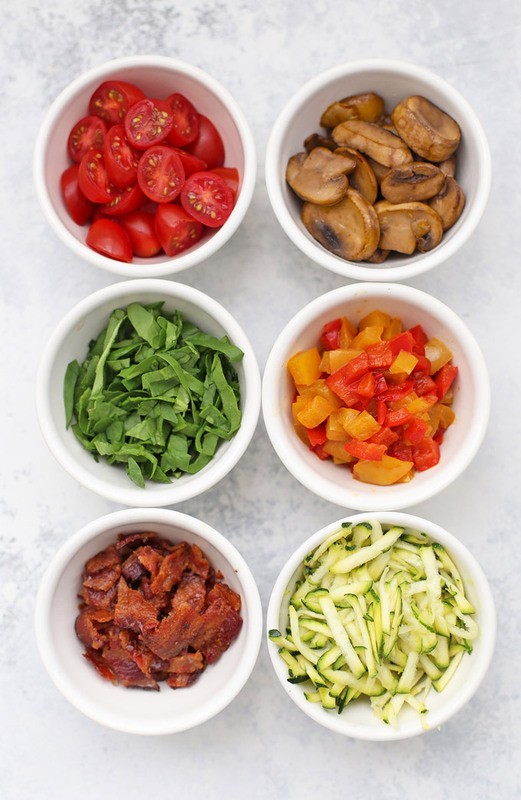 GET CREATIVE WITH VEGGIES: My go-to veggies are things like bell peppers, onions, tomatoes, mushrooms, spinach or kale, cooked butternut squash or sweet potatoes. But don’t hesitate to think outside the box! Why not try grated zucchini, sun-dried tomatoes, or green chiles? 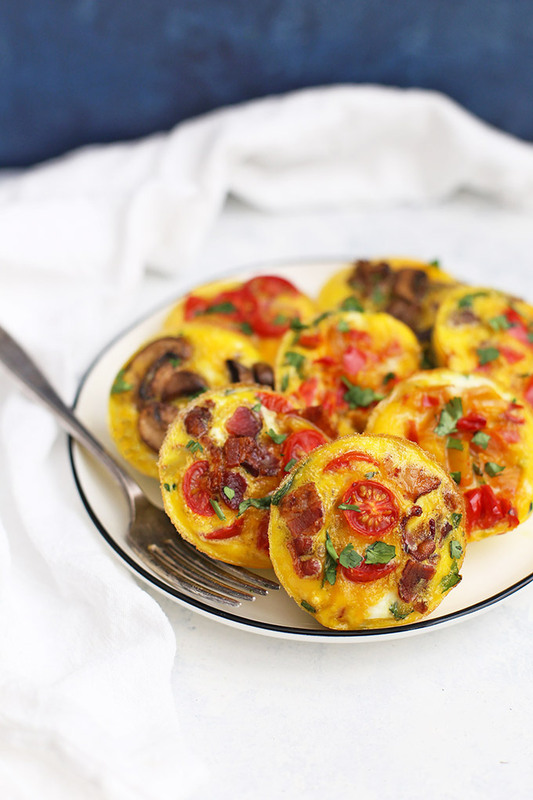 These quiches look delicious! I mean, there’s ham so they have to be good right? These all look so yummy, and making different ones would really step up the ‘keeping it interesting’ goal! I’ve been waiting my whole life for someone to tell me I need to up my fat intake 😉 These look so yummy! I tried making some of these today. I love them! They are so simple to make and are so versatile. I can’t wait to try another batch with some different flavor combinations. Kim – I’m so glad you liked them! I make a batch every week or two with something different. It’s fun to see what people come up with! These turned out great, just took them out of the oven. I used strips of leftover baked ham, criss crossed on the bottom. I had leftover cooked veggies(broccoli, cauliflower and carrots from a bag of frozen) and topped each “muffin” with those snippets of tomato from the ends that no one wants to eat. I added no seasonings at all, the ham flavored the the quiches perfectly. Will do these again. My next experiment with these will be with fruit and bacon as the ingredients. I think the sweet and salty will turn out fabulous. Thanks, great recipe and EZ! Yum! That sounds so good! I’m glad they turned out well for you! What is the best way to reheat these? Thanks! Sue – Yes! I freeze them in a single layer (so they don’t stick together), then I reheat them in the oven (or you can microwave them) as needed. Easy-peasy! Do you happen to know what the macros may be for each? Robert – That’s tricky–it will totally depend on what toppings you put into them. (If you add sausage and bacon, the macros will be different than if it’s bell peppers and spinach.) There’s about .8 egg in each one, so the egg macros will be around 4g fat, 0 g carbs, 4.8g protein for the egg in each + whatever toppings you add. You can plug in your ingredients and amounts into MyFitnessPal to get a really clear answer. I hope that helps point you in the right direction! Looking forward to making these with my kiddos! 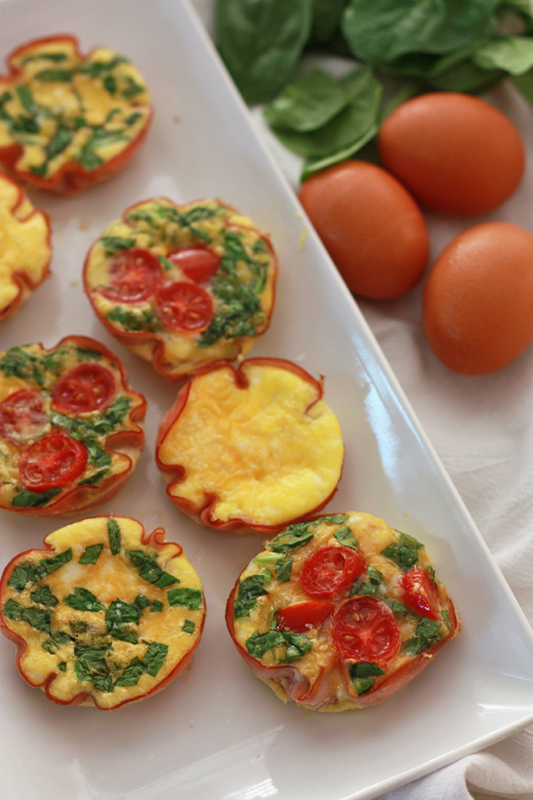 We love trying new recipes for quick breakfast/snacks on the go. Wondering if anyone cooked these in standard cupcake liners before? Thinking it’ll save time greasing the metal muffin pan. Thanks! Great recipe and good tips! If I wanted to add some shredded cheese to these, at what step would I do that? With the eggs or sprinkled on top? Thanks! Does thawing produce a wet quiche texture? Does it taste as good as hot out of the oven? Chris – When I heat them up in the oven, no one has noticed a difference. If you re-heat them in the microwave, they can sometimes seep a little bit of the moisture, but the re-heated texture difference (for me and my husband, at least) has been negligible. Hope that helps! Oh, I’m SO glad to hear that! That’s wonderful! If you freeze for later use, do you thaw first before heating in the oven? your recipe made it to a Men’s Health article. I am so excited for you! Oh my gosh! I’ll have to go check it out to see if I can find it! Can I just say YUM!!! YAYYY!!! I love hearing that!